Bitcoin Trading Signals 2019. When to Buy Bitcoin? When to buy and sell Bitcoin? Free singnals from Bitcoin trading bot. Bitcoin is high-profitable and easy to trade last years. Simply jump on the trend and ride it. It's easy for experienced traders. But when to buy and when to sell Bitcoin, if you are beginner? BTC trading bot solves this problem and generates 20-300% profit per year. Bitcoin trading signals updated every 4 hours (1-2 new signals per month). Just check these signals at least once per day and be quick to take more profit. 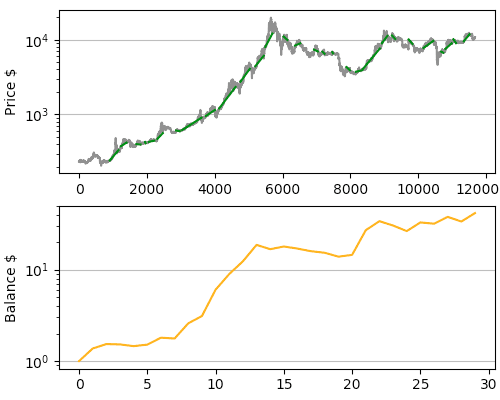 BTC bot uses trend-following system. It takes profit when there is a big trend, other times it save you capital waiting for a trend. The system must be profitable as long as there is at least one strong trend per year, or it will slowly lose. More trend-following traders - higher trends. Higher trends - more profit. So join us to get more together. , because it's a low-frequency signals for comfortable trading. It is limited risk trading with good profit. Experienced traders can use high risk margin trading to take more. But never risk too much. Start with small-size account to gain experience and increase it gradually with increasing profits. Use this time and experience to develop your own trading system - profitable bots do not live forever.